Obituary for Theodore (Ted) Osesky | Résidence Funéraire Fawcett Funeral Home Inc. It is with deep sadness that we are announcing the passing of our beloved father, brother, uncle, grandfather and friend. He lived a rich, loving and happy life on a grand scale to 93 years young. Dad was a humble soul with family always at the center of his world while going above and beyond to provide service to his community throughout his life. He passed away peacefully at home with his family by his side on Wednesday, November 14, 2018. Born in Leonard, Manitoba on March 12, 1925, he was the son of the late John and Maria (Bulbuck) Osesky. From humble beginnings in Leonard, he went from an Orderly at St. Joseph Hospital in Port Arthur to work as a Funeral Director at Everest Funeral Home, which paved his way to becoming owner/operator of Fawcett Funeral Home, Fawcett Ambulance Service, a Flower Shop and Insurance brokerage in Geraldton, ON. for the next 36 years where he raised his family. Dad always inspired to do more, having already pioneered bringing an ambulance service to the district working with the Ministry of Health and being one of the founding fathers of St. John’s Ambulance brigade. We have great pride in our father for his social conscience in bettering his community and serving in the following organizations over the years: Lifetime member of Rotarians, Royal Order of the Moose Lodge, 4th Degree Knights of Columbus, Member of the Geraldton Hospital Board, St. John’s Ambulance Chair, Member of Legion, former Mayor of Geraldton, resided on Geraldton Town Council for 17 years, and many others. In 1977 Dad received the Honour Title of Esquire from the Order of Canada from Governor General Jules Leger for his years of service to St. Johns Ambulance in Ontario and in 2001 Dad was promoted to Commander of the Order of St. John, receiving this honorable accolade from The Right Honorable Governor General Adrienne Clarkson. In 1985 Dad became a Justice of the Peace in Ontario and moved to Thunder Bay in 1990 when he retired from the Funeral Business. 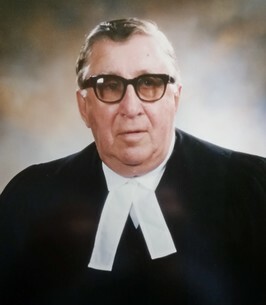 He continued as Justice of the Peace as well as joining many other organizations such as Mental Health Assoc., active member of Rotary for 70 years, continued to be instrumental in founding new community ventures such as the Dew Drop in with Father Scott Gale and the Pet Therapy Program through St. John’s Ambulance. Throughout his life, Dad loved spending time with his immediate and extended family far and wide with many trips back to the homestead in Winnipeg, Leonard and Russell, Manitoba to spend time with his sisters and brothers. Dad still had time to pursue favorite hobbies such as trips to camp, fishing, skidooing, saunas at camp, gardening and late-night fish fries, bonfires and poker games, golfing and curling. In his later years, attending Rotary became the highlight of his week whether minus 30 or not, he never missed a day. Ted is survived by his sister Katie Butcher in Kelowna, BC, four daughters Erin, Maureen (Jim), Kim (Ronald), and Sheila (Kevin), daughter-in-law Jennifer (Teddy) and his grandchildren: Adam, Nicholas, Jessica, Chelsea, Kathleen, Shannon, Matthew, Todd, Thomas, Ruben, Mckenna, Noah, Marti, Kaysa, Kyler, Tristan, Stephanie, Jamie-Lee, Brett, Taylor, Madisyn and Mikalea. Ted was predeceased by his parents John and Maria, loving wife Mary-Lois Elizabeth (McKenna), son Theodore John “Teddy”, brothers Mike, Joe, Peter, Nick and George, and sisters Sadie, Lena, Rosie, Vera, Marge and Doris. Special thanks to Dr. Anna-Ly Kald who attended to our dad for many years and for her compassion and guidance during his final journey. Special thanks to Spencer Hari and Sydney Gratz for their friendship and exceptional caregiving as personal support workers, both to Dad and the whole family. We would also like to thank Laurie Norris, Geoff Hall and Jennifer Roberts for their support and kindness. Thank you from all of us to the many friends, extended family, organizations and community members that inspired our dad and brought so much joy and fulfillment to his life. If anyone so chooses to Donate, we would appreciate The Dew Drop Inn and the Pet Therapy Program thru St. John’s Ambulance as the recipients. Funeral services will be held on Monday, November 19, 2018 when family and friends will gather in St. Andrew’s R.C. Church for the Funeral Mass beginning at 11:00 a.m. celebrated by Rev. Antoni Fujarczuk. A private family internment will follow at Sunset Memorial Gardens to rest forever more next to mom, Mary-Lois Elizabeth. Visitation for friends will be held on Sunday, November 18, 2018 from 1 p.m. to 3 p.m. with Vigil Prayers being offered at 2:30 p.m. in the Sargent & Son Funeral Chapel, 21 N. Court Street. God saw you getting tired with a life well lived: meant to be. So he put arms around and whispered ”Come with me.” He knew how much you had been through and he gave peace and rest. God’s Garden must be beautiful because he only takes the Best. Our Father whom art in Heaven, Ted Be Thy Name. On-line condolences may be made at www.sargentandson.com.